Here i am presenting you a Low cost sound amplifier. 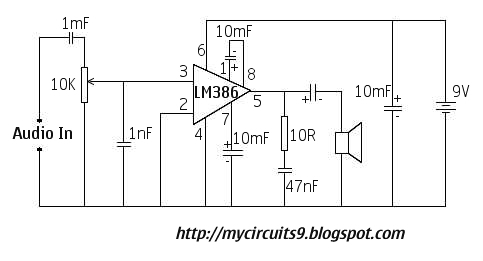 LM386 IC is the heart of this circuit, it is capable of amplifying weak audio or music signals. Connect the audio input of the circuit with the output of signal source in which the sound to be amplified. Use this project to increase the sound of a music player, a microphone, or for an I-pod. The circuit gives an output power of about 1Watts. 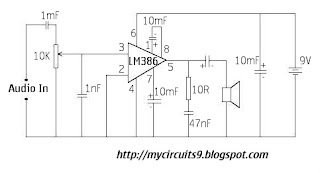 LM 386 is a versatile, 8 pin dual input package ic. Which is commonly used to amplify low power signals. Normally it provide a gain of 20 and is able to increase upto 200. 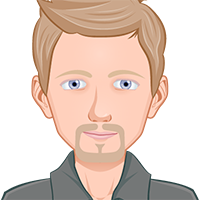 One of the main advantage is that it consumes only a low voltage. Good job. You are from Kollam ,right? can we use this amplifier from dvd input? What if i need 8 watt or more output? Which cap is betwn pin5 and the speaker? Pls guide. put 220mf cap between pin5 & spkr. Name the cap betw pin 5 & speaker.